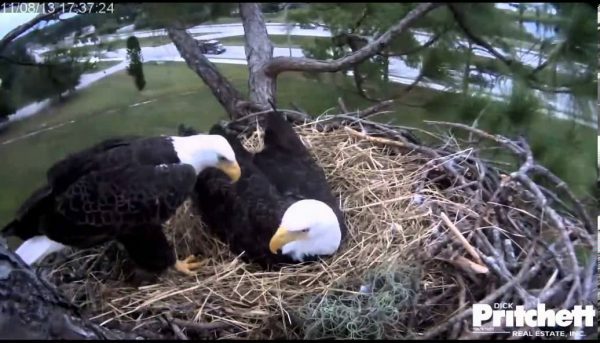 Bald eagle aficionados in Florida were thrilled to watch the live hatching of an eagle egg over the weekend through a wide angle web cam mounted above the nest. But the excitement is not over yet as the parents, Harriet and M15, continue to take turns incubating their second egg in McGough Nature Park in Largo, Florida. The young chicks are a testament to the success of reintroducing bald eagles to Florida after years of being threatened. After the eagles hatch, the parents continue to work together, taking turns to retrieve food that include rodents and bugs. The eagle cam has been documenting the live hatching of eagles since 2012 and has received more than 60 million views. Stay tuned and see for yourself as this latest chick is due any day.